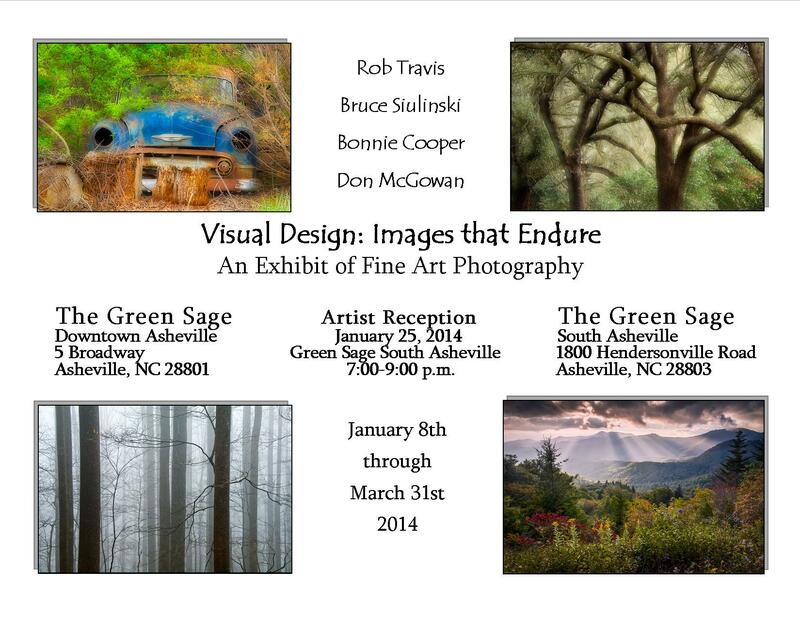 (Asheville, NC) Four Western North Carolina photographers have joined together to exhibit their images at The Green Sage Coffeehouse & Café locations in downtown and South Asheville (see link below for directions and hours). Mark the date! See you at the reception! The images exhibited have a heavy emphasis on nature with a selection of landscapes and portraits of flowers and trees. In keeping with the theme of “Images that Endure” there’s also nostalgic photographs including a series of rustic cars. Today’s photographers have a wide choice of materials on which to offer their images to customers. The images on display include those on photographic paper framed under glass, canvas and metal. 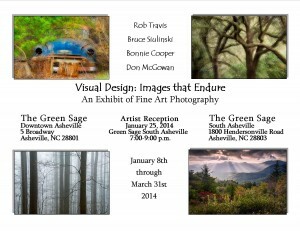 Cooper resides in Asheville and has practiced photography with passion since 2000. Her images celebrate the beauty of the natural world around the country. She works as an artist, teacher and writer and assists in the EarthSong Photography Workshops and tours. McGowan, also of Asheville is a professional nature photographer. Through his photography he is “creating a connection with the earth and using my camera to express that connection; and then by extension to invite all of you to share it with me.” In addition to his fine art photography and commercial services, McGowan leads the EarthSong Photography Workshops and tours. Siulinski studied graphic design and photography in Texas before moving to Brevard in 2004. Favorite subjects are nature and landscape images often of forests and the coastal regions of the Carolinas and Maine. He has a passion for outdoor sports – skiing, fly fishing, windsurfing and kayaking and these interests shape his photography and often provide the creative ideas behind his work.